In keeping with today’s holiday, Publisher’s Weekly printed a list of the ten worst fathers in literature. Number 1 on the list was Humbert Humbert. Number 2 is Ram Karan a character from Akhil Sharma’s An Obedient Father, who commits a horrible crime against both his daughter and his granddaughter. The entire (depressing) list is here. close throughout Peck's life. Seeing this reminds me of my own good fortune. 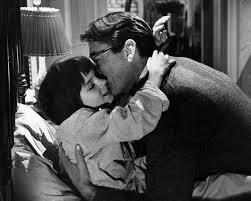 After reading it, I wanted to come up with my own list of good fathers in literature. I seem to be able to think of only one: Atticus Finch. I’ve excluded those figures that appear as father figures, e.g., uncles and friends, as well as those that are dead or die shortly after the story begins. Other suggestions? I like your choices. My daughter also mentioned Mr. March--I remember getting teary reading the scene where Beth gets out of bed when she hears her father come in the door. Not only are the good parents from children's lit, they're mostly from OLD children's lit! Parents in kids' books now are more realistic - a mix of strengths and weaknesses. I think good parenting doesn't make for good literature. In adult fiction, we want to explore conflict, and the legacy of family secrets, and such. Laura, I agree, we do want complexity from our characters and I suppose this has "trickled down" (awful phrase) into children's lit. Thanks for your feedback re: the new look. And I'm glad to know that Amy is your friend from wmtc! Welcome Amy.